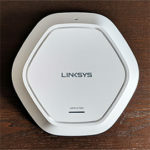 The Linksys WRT3200ACM is among the two most powerful wireless routers from the Linksys WRT series (along with the WRT32X) and a successor to one of the most popular AC1900 router, the WRT1900ACS. 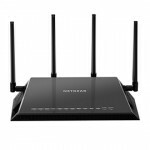 As the name suggests, the WRT3200ACM is an AC3200 device, but this may be misleading for some, because we are not dealing with a tri-band router (which means that there’s no additional 5GHz radio and the router features the usual dual-band radios), but instead Linksys implemented the Tri-Stream 160 technology, therefore making the WRT3200ACM the first router to support contiguous 160 MHz bandwidth channels in 5Ghz. I already had a look at another router which also supports 160MHz bandwidth mode (the NETGEAR Nighthawk X4S R7800) but it is implemented in a 80 + 80 MHz setup. I’m glad that Linksys wanted to go further with the technology development, but even in 2018, the devices that do support contiguous 160 MHz bandwidth channels are very difficult to find, so, this new feature will be useful only if you have at least two devices of the same kind (two Linksys WRT3200ACM or WRT32X) linked in bridge mode (I did get fantastic results with the Asus PCE-AC88 as well). While the usual client won’t be able to take advantage of any of the main selling points of the WRT3200ACM, this router will help improve some networks, so let’s see if it’s worth upgrading over the WRT1900ACS and if it’s able to rise up to its newer competitors. 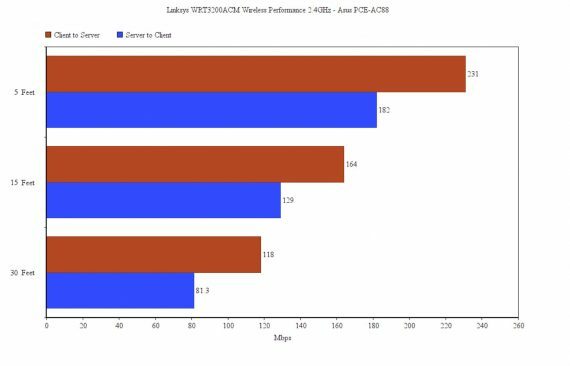 UPDATE 07.22.2018: The Linksys WRT3200ACM has gone through multiple radical changes during its two years of existence, so, while at the beginning the router would function properly and had a fantastic wireless performance, sometimes last year, lots of users started complaining that the WRT3200ACM was having serious issues with the 5GHz radio (some have hinted that it may be a hardware problem and that the Marvell chip needed to be changed) and that the LED lights would become dim after a few months of normal use. Considering that the review I did a year and a half ago may not portray the current condition of the WRT3200ACM, I re-purchased it and retested the device to see if Linksys has managed to release a stable firmware which would at least solve the 5GHz radio instability. UPDATE 11.21.2018: I have been using the Linksys WRT3200ACM for the most part as the main router, so considering that almost four months have passed, I have retested the device in a new location (which is more difficult to cover with WiFi) and the results are consistent with what I got in July (comes at no surprise considering that Linksys hasn’t updated the router in a long time now). To give you some spoilers, I have not encountered any of the expected problems on the 5GHz band and the LEDs so far are still bright enough. 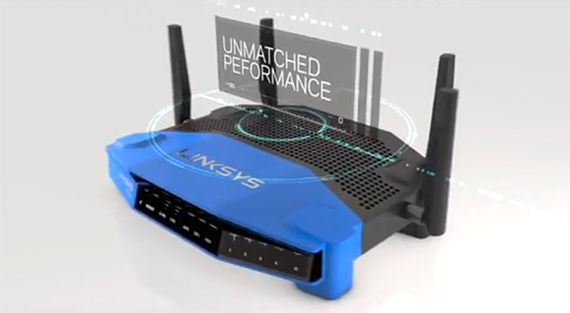 A few years ago, Linksys made the decision to take inspiration from the design of the iconic Linksys WRT54G and create a soul successor which will take the Linksys legacy further. That’s how the WRT1900AC was born, a device which besides being one of the fastest AC1900 router on the market, it used a very unique case design which not only gathered the nostalgic fans, it also caught the attention of a new audience which was exasperated by the continuous release of the similar-looking black or white consumer-focused routers. 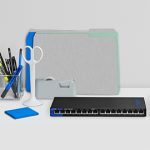 The designers from Linksys liked the new appearance so much that they decided to keep it for the entire series, making it pretty hard to tell the routers apart (except for the WRT1200AC, which has two antennas and the LINKSYS WRT32X AC3200 which is just completely black). I know that the design is the least important aspect in a router, but I find it a bit ridiculous that I can’t really tell apart the WRT1900ACS from the WRT3200ACM (it’s been almost two years, bring something new to the table!). 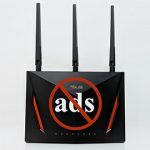 Despite borrowing the design of the WRT1900ACS, the WRT3200ACM looks a lot better than a lot of other routers on the market, the case being divided into two parts: the back side which is covered by a black matte finish and with lots of holes on top for a proper airflow and the blue front side, which is a bit glossy (but does not retain fingerprints). The dual-band removable antennas are positioned in the same manner, with two of them on the back side and the last two, each on one side of the router (since they’re reasonably small and close to the rear side, it won’t pose any inconvenience). The footprint of the WRT3200ACM remains the same, with 9.68 x 7.63 x 2.04 inches and the weight is a bit lighter (28.16 oz), so it falls into the fairly large routers category (along with Asus RT-AC88U and Netgear Nighthawk R7800 X4S). By default, the WRT3200ACM can be positioned flat on a surface, but it can also be wall-mounted if you lack enough space to keep it properly ventilated (every feet has special holes to use for wall-mounting). On the bottom side of the router, there are four rubber feet that are large enough to keep the device sturdy even if you connect all the ports and there are another two sections of numerous puncture holes that help keep the case well ventilated (and the WRT3200ACM definitely needs it since Linksys decided to remove the fail-safe fan on the early model of WRT1900AC). Also on the bottom, there’s a small label which contains various info about the device (such as the Serial Number, the MAC Address and the default SSID and password). 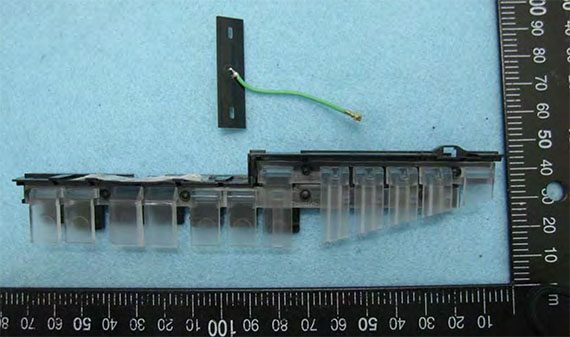 On the front of the device, on the black glossy plastic, there is a series of white LED lights (seven directly on the front and five slightly towards the right), which show the status of Power (if it blinks, it means that it is booting up or it’s in self-diagnostic mode), Internet (if it’s solid amber, it means that the connection is down because of some configuration issues and if the LED blinks an amber colour, then the connection is down because of hardware problems), the 2.4GHz and 5GHz band (if either of the two LEDs are blinking, then the router is receiving or sending data), eSata, USB 1, USB 2 (there are two indicators, on top of each other: the line and the dot indicates a USB 3.0 device has been connected and if the dot is turned off, then a USB 2.0 device has been connected), the four LAN Ethernet ports (every port has a primary T indicator and a secondary dot indicator: if the dot is turned off, then there is a device connected at 10/100Mbps, otherwise, the connection is at 1000Mbps) and for the WPS (if the LED is solid white for 5 seconds, then the connection has been successful, otherwise, if the LED blinks an amber colour, then the process has failed). UPDATE: A quick look inside the case has revealed that the port LEDs are big and will function properly for a long time, while the rest of the LED indicators are smaller and ‘forced’ to produce the same level of brightness, so this may be the reason why so many people have complained about the LEDs getting dimmer over time – after four months, the LED indicators are still as bright as the day I purchased the router, but this could still change in the future. Flip the router around and you are greeted by lots of ports and buttons: from the left, there’s an antenna connector, a WPS button, four Gigabit (10/100/1000) Ethernet LAN ports, an Internet port, a USB 3.0 port, a combo USB 2.0 / eSATA port (it’s nice to see that Linksys didn’t put any USB ports on the front or lateral sides), a small red recessed button (press it for 10 seconds to reset the router to factory default settings), the Power port and another antenna connector. Just like with any other model from the WRT series, the WRT3200ACM does not really have an elegant design and it may not feel at home in a living-room with classic furniture, but, the case is not ugly by any means and it will fit in on a desk along with a modern desktop PC. Note: Inside the package, you can find the Linksys WRT3200ACM unit, a Quick Start Guide, a CD with documentation, an Ethernet cable, the Power adapter and the four antennas. On the inside, the Linksys WRT3200ACM is equipped with a dual-core 1.8GHz Marvel Armada 88F6820 ARMv7, Marvell 88E6352 switch, 512 MB of RAM (Micron DDR3) and 256 MB of flash memory (Spansion NAND). Furthermore, the 2.4GHz radio band uses the Marvell 88W8964 chipset, along with a Skyworks SKY85309-11 2.4GHz front-end module and the 5GHz radio band also uses the Marvell 88W8964 chipset, along with the Skyworks SKY85728-11 5 GHz front-end module. 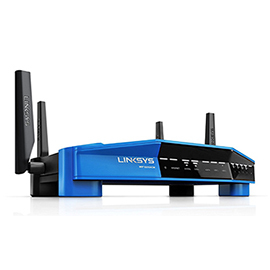 The Linksys WRT3200ACM features a maximum theoretical data transfer rate of 600 Mbps using the 2.4GHz radio band and the maximum theoretical data transfer rate of 2600 Mbps using the 5GHz radio band (added to the advertised 3200 Mbps). 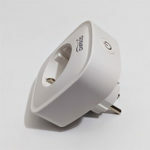 Note: The power consumption, while operational, is approximately 33 Watts. 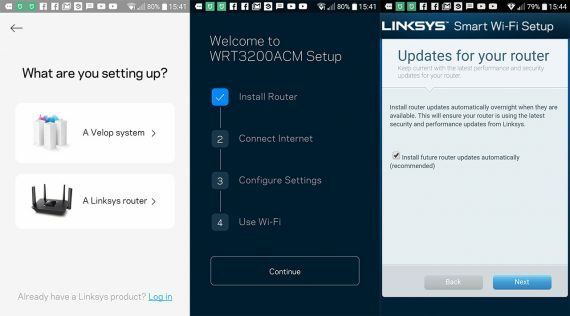 The Linksys WRT3200ACM is a 3×3 AC3200 class router, but, as said in the introduction, we are not dealing with a tri-band router and one of the main signs is because it uses the MU-MIMO technology (as expected the AC3200 line is commonly used by routers that feature the Broadcom’s XStream Tri-band technology, such as the TP-Link AC3200, D-Link DIR-890L and Asus AC3200). The usual tri-band router features an additional 5GHz radio band, besides the common dual-band setup and it helps a lot with the network stability by balancing the load between the three radios, therefore increasing the throughput (not the link rate!). This means that a tri-band AC3200 router will work as an AC1900-class device, but will be able to handle a lot more wireless connected clients and ensure a better network stability. The Marvell’s MU-MIMO technology is a totally different beast and the way it works is that instead of serving one client at a time (the usual SU-MIMO approach), multiple users can be served simultaneously. This means that every connected MU-MIMO client receives an individual data stream (thus removing any competitiveness for the bandwidth), allowing users to play online games or perform any video streaming at the same time, without experiencing any latency. This technology sounds fantastic and a must-have in every household, the only problem is that the market hasn’t really caught up with the velocity of the networking technology development (there are still lots of people and companies that consider the 802.11ac standard as something exotic – this statement remain true even in 2018, when we’re already entering the realm of the 802.11ax!). 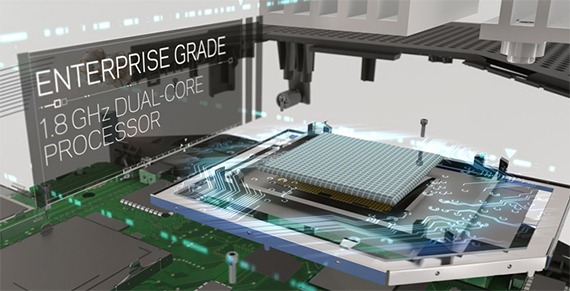 So, the MU-MIMO technology isn’t a solution for the present and more likely for a possible future where MU-MIMO compatible wireless cards are something usual and wide-spread (although at this point in time, I’m not holding my breath). The main selling point and the reason why Linksys WRT3200ACM has been developed is the Tri-Stream 160 feature. To get a better understanding about how this tech works, let’s take the usual three-stream AC1900 router (3×3), with each stream maxing out at 433 Mbps using the 80MHz bandwidth mode (therefore going to the maximum advertised rate of 1,300 Mbps for the 5GHz radio band). The Tri-Stream 160 technology uses pretty much the same concept, but instead of using the 80MHz bandwidth mode, you get three streams at 160Mhz channel width, therefore driving data at 867Mbps on each stream (adding up to the advertised 2,600 Mbps on the 5GHz radio band). The Tri-Stream 160 sure sounds like a game-changer, but can the usual person actually use it with any of the currently present devices? Umm, no. The only device that supports this tech is another WRT3200ACM router (internal data streams will be fantastic using the bridge mode, without a doubt) and, since there aren’t many compatible wireless adapter on the market (smallnetbuilder.com says that the Intel Wireless-AC 9260 supports this feature), but if you use 1×1 or 2×2 wireless adapters, the WRT3200ACM will perform similarly to a higher end AC1900 router and nothing more. This is a sin that almost all router manufacturers are guilty of, inflating the box number as much as they can, while the usual person will be hypnotized into thinking that they’ll get the link rates from the box. That being said, the WRT3200ACM is definitely future-proof, but I’m not really sure that this is the future of the networking world (Linksys thinks so and it has prepared way ahead of time) and my opinion is that a tri-band router (while definitely not being superior), has the advantage of not needing any special compatible wireless adapters, just ones which use the 5GHz radio band (furthermore, the tri-band approach has worked out great for the WiFi mesh systems (such as the Orbi, Eero 2nd Gen or the Velop) that needed a reliable way of handling the backhaul traffic). UPDATE: As an update to my previous statement, the 802.11ax may prove me wrong and the 160MHz channel bandwidth is going to become the norm, therefore indeed making the WRT3200ACM one of the most future-proof wireless routers that I have tested. 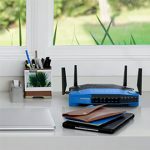 The last feature that I want to mention from the Linksys WRT3200ACM is the Beamforming technology which has the role of optimizing the network performance by scanning the area, identifying the connected devices (wireless) and focusing the signal directly at them, instead of broadcasting it everywhere, hoping it will reach the connected clients. In order to test the wireless performance of the Linksys WRT3200ACM, I took a laptop with a compatible wireless adapter and a desktop PC (also with a built-in compatible wireless adapter equipped with one of the most powerful wireless adapter on the consumer market, the Asus PCE-AC88) and I measured the speed performance at different locations inside a large house. UPDATE: I have kept the initial test results to showcase the improvements that Linksys has made over the years and the new tests have been done after three days four months from the purchasing date (in a new location) and the router has been kept running continuously during this period in order to see when (and if) I will experience the same problems with the 5GHz radio band – the WRT3200ACM has been updated to the latest firmware, the v1.0.6.186168 (Linksys decided that their router series is perfect and no updates are needed anymore). So, using the 2.4GHz radio band (and implicitly, the 802.11n standard – 20MHz bandwidth mode), from the client to the server at close range (5 feet), I measured an average of 231 Mbps 151 Mbps (it peaked at 156 Mbps). Afterwards, at 15 feet, the speed decreased to 144Mbps decreased to 164 Mbps and at 35 feet, I measured an average of 115 Mbps 70 Mbps. Even if the new location is not that WiFi-friendly as when I tested the device in July, I still got better results than a year and a half ago, so the WRT3200ACM is still doing good on the 2.4GHz band. From the server to the client, at no more than 5 feet away from the router, I managed to measure an average of 182 Mbps, while at 15 feet, the speed went down to 129 Mbps and at 35 feet, I measured an average of 81.3 Mbps. Since I got an overall better wireless speed performance on the 2.4GHz band, I switched to the 5GHz radio band (the 802.11ac standard and the 80MHz bandwidth mode) and using the Asus PCE-AC88, I got the following results from the client to the server: 5 feet away from the router, I managed to measure an average of 811 Mbps (with the peak at 930 Mbps), while at 15 feet, the speed went down to 720 Mbps (a welcomed improvement over the 647 Mbps from the last time I tested the device) and lastly, at 30 feet, I measured an average of 534 Mbps (obviously, unless you use the best WiFi adapters on the market, you won’t see this type of performance). From the server to the client, I got the following results: at close range (no more than 5 feet), I managed to measure an average of 235 Mbps, while at 15 feet, the speed decreased to 233 Mbps. Lastly, at 30 feet, I measured an average of 165 Mbps. As you can see, the speed performance on the 5GHz radio from the client to the server has remained pretty much consistent to what I measured the second time I tested the WRT3200ACM, but the server to client performance is really nothing to brag about and significantly below what the Asus RT-AC86U can deliver. 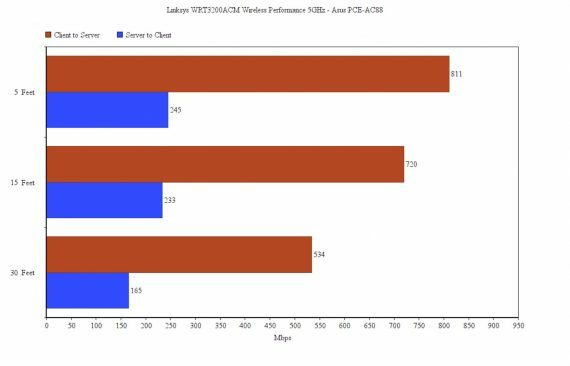 Because the router has a USB 3.0 port, I had to measure the storage performance and see how it stands against its predecessor, the WRT1900ACS. So, I took a 2.0 GB folder containing multimedia files (videos, music and books) and I measured a writing speed of 88.5MBps and a reading speed of 113.1MBps. 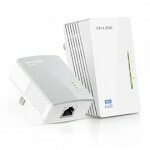 This makes it one of the fastest router from the storage point of view available on the market right now. 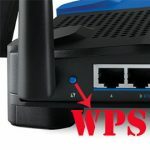 The setup process of the WRT3200ACM is as simple as with any other modern wireless router: connect your PC to the wireless name and use the password shown on the label (from the bottom of the device) and open a web browser to launch the Linksys Smart Router Setup (if the wizard doesn’t launch instantaneously, go to linksyssmartwifi.com). The setup wizard will guide you through configuring the Wireless Settings (the SSIDs and the password for both radio bands), create a new router password (along with a hint) and create a Linksys Smart WiFi Account (which allows you to access your network remotely). By default, the connection type settings are done automatically, but you can also get the option to perform the manual configuration. After finishing the initial setup, you gain access to the UI to configure your router at a more in-depth level. UPDATE: The second time I configured the WRT3200ACM, I used the Linksys mobile app (the same that is used to configure both the tri-band and the dual-band Velop systems) and the steps were pretty much the same as on the browser-based interface: selecting ‘A Linksys Router’ instead of ‘A Velop System’, connecting to the router’s WiFi network and waiting until the device gets detected by the app, installing the latest firmware update, setting up the two WiFi networks and that’s pretty much it – from here on, you’ll be able to freely roam the mobile and the browser-based interfaces. The main page of the browser interface has a menu on the left with all the important sections with options, each showing a new window in the centre. On the right side, you get nine small windows which show the Status of the Network, the Linksys Home Networking shortcut, the WiFi Settings, the Guest Access, the status of the Parental Controls, the External Storage, the Media Prioritization status and the Network Map. 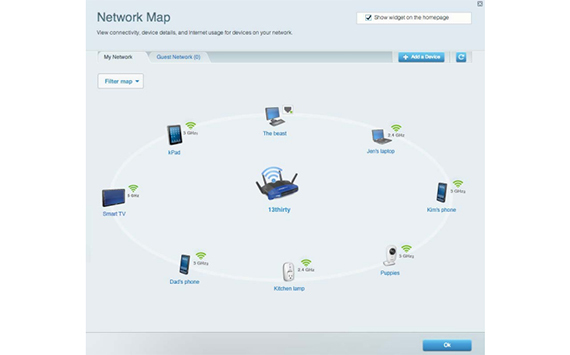 The first section is the Smart WiFi Tools and has the following options: Network Map (a graphical representation of your network, including the Guest Network and the Internet Usage), Guest Access (allows you to create guest network names with passwords and you can choose the maximum number of guests allowed), Parental Controls (you can restrict access to specific devices, block the Internet access during specific times or always and block specific websites), Media Prioritization (drag and drop devices in the normal or high priority section and choose the Applications along with the Online Games for those sections), Speed Check and External Storage (Status, Folder Access, FTP Server and Media Server). Directly underneath the Smart WiFi Tools, you can see the Router Settings: Connectivity (the Basic settings – Network Name and Password, Router Password, Firmware Update, Time Zone and Activity Lights; Internet Settings – IPv4 or IPv6 Connection Type, MAC Address Clone and MTU; Local Network – Router Details and DHCP Server; Advanced Routing – NAT, Dynamic Routing and Static Routing; VLAN – VLAN, Internet(Trunk) and Ethernet; Administration: Local Management Access, UPnP and Application Layer Gateway), Troubleshooting (Status, Diagnostics and Logs), WiFi Settings (Wireless settings, MAC Filtering, WiFi Protected Setup and Wireless Scheduler), Security (Firewall – Firewall, VPN Passthrough, Internet filters and IPv6 Port Services; DMZ; Apps and Gaming – DDNS, Single Port Forwarding, Port Range Forwarding and port Range Triggering) and OpenVPN Server. 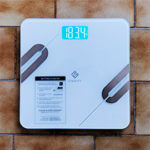 While the app was quick and intuitive, I noticed that the web-based interface was slow and I had some trouble finding some options (such as something as simple as finding where to upgrade the firmware – as a hint, it’s under Connectivity). 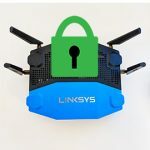 Besides the MU-MIMO and the Tri-Stream 160 feature, the third main selling point of the Linksys WRT3200ACM is the support for Open Source firmwares. Since the router is made with this type of compatibility, the OpenWRT or DD-WRT custom firmwares will be more stable than on the other routers, but there’s something I did not quite understand. While the WRT3200ACM is advertised as being Open-Source Ready, on their website it is written: “Installing 3rd party firmware is done at your own risk and replacing factory-installed firmware with open source firmware will void your warranty.” So, while Linksys encourages you to go for third party firmwares, it will not fix the product if something goes wrong. 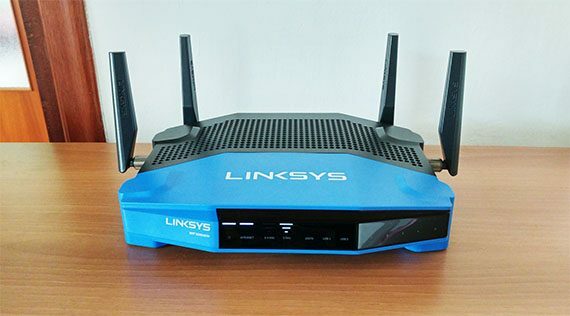 UPDATE: The support for open-source firmware has been one reason why so many people decided to go with routers from the WRT series, but, unlike other manufacturers that have been generally well regarded by third-party developers (such as Asuswrt-Merlin for Asus routers), Linksys seriously lacks in this department. At this moment, I would not recommend using DDWRT with the WRT3200ACM (it brings almost nothing new in terms of features and it feels dated), but I did notice a lot of positive feedback from the LEDE project team, so, if you want to use a third-party firmware, I would go for OpenWRT. I’m not really sure what to think about the Linksys WRT3200ACM because for me, it’s a mixed bag. On one hand, you get an above average wireless performance (and as an update, the router did really well in a more difficult location), a fantastic storage performance and a simple-to-use app interface (while the browser-based interface is very slow – this hasn’t changed). 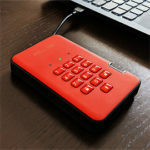 But, on the other hand, all of these new features lack any usability in the real world and the only people to take advantage of them would be those that actually purchase two of these units and use them in bridge mode lacked usability for a long time, but the emergence of the 802.11ax standard could reshape the market and make the WRT3200ACM a device way ahead of its time (although it can be too outdated by the time this happens). Furthermore, the support for custom firmwares had the potential to make this router one of the fastest on the market, but so far it didn’t happen, so considering the great advances of the LEDE Project, I’ll also try to install it on my unit and retest it after some time has passed. Overall, in its current condition (and four days since I have it four months since I got it), the WRT3200ACM is still performing really well, so I’ll keep it for a while longer to see if Linksys managed to fix all of the issues and has made the WRT series great again and although I can’t speak for the large majority of the devices out there, the Linksys WRT3200ACM that I have used until now performed better than expected. Note: As a side note, I had to reconnect one client a couple of times during this period of time, the Android devices would stay connected to the 5GHz network without problems and, as for Apple device, unfortunately, during the last four months I had none to test the connection.